Access the full, latest version of the breed standards with scoring and standardised colour descriptions. A comprehensive list of all shows with Regional status, the Club Show, and their dates. Birds, eggs,.. Find whatever you’re after amongst our members’ stock listed in our classifieds section. Welcome to the British Barnevelder website. I would like to take this opportunity to welcome you to the British Barnevelder Club website. The Club was founded in 1922 shortly after the first Barnevelders arrived into this country from The Netherlands. 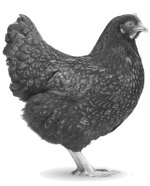 Barnevelders are a brown egg laying breed and are kept in a variety of colours, the main colour being the double laced which has black lacing and a chestnut brown ground colour. For many years we have only seen this colour pattern but more recently the Silver Laced and the Blue Laced have become more popular along with the White and Black which are seen occasionally. We welcome new members to help encourage and support our wonderful breed. Although we are only a small club the benefits of this breed are that you have a breed that lays a good quantity of eggs and you can also show them with reasonable success.